Today's So Shoe Me is the Vinilo Ibisco Oxford by Buffalo X Solestruck, $245, available at Solestruck. Take a trip in double vision with these two-soled oxfords that are the quintessential quirky little lace-up collaboration between Buffalo and Solestruck. The candy coated clear upper in a sickeningly sweet cotton candy pink add a new rave style to your favorite little summer basics. A new take on stacked platforms these doubled up soles add the perfect contrast between the classics and club kid aesthetics. Pair these hot and heavy vinyl oxfords with a sequin smiley bustier worn over a pastel tie dye mini for the perfect party ready summer look. 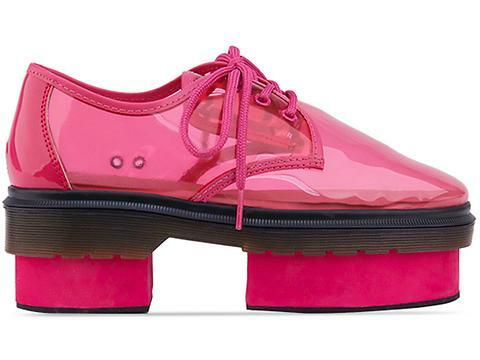 So Shoe Me a pair of psychedelic pink platforms that will add a rad 90s touch to my favorite summertime staples.